Hive is a highly addictive strategic game for two players that is not restricted by a board and can be played anywhere on any flat surface. Hive is made up of twenty two pieces, eleven black and eleven white, resembling a variety of creatures each with a unique way of moving. With no setting up to do, the game begins when the first piece is placed down. As the subsequent pieces are placed this forms a pattern that becomes the playing surface (the pieces themselves become the board). Unlike other such games, the pieces are never eliminated and not all have to be played. The object of the game is to totally surround your opponent's queen, while at the same time trying to block your opponent from doing likewise to your queen. The player to totally surround his opponent's queen wins the..
Hive is a highly addictive strategic game for two players that is not restricted by a board and can be played anywhere on any flat surface. The base game of Hive is made up of twenty two pieces, eleven black and eleven white, resembling a variety of creatures each with a unique way of moving. 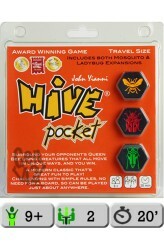 Hive Carbon and Hive Pocket include the Mosquito and Ladybug expansions, for a total of 26 pieces. With no setting up to do, the game begins when the first piece is placed down. As the subsequent pieces are placed this forms a pattern that becomes the playing surface (the pieces themselves become the board). Unlike other such games, the pieces are never eliminated and not all have to be played. The object of the game is to totally surround your opponent's queen, while at the same time trying to..
Hive Pocket bevat standaard de Ladybug en de Moquito uitbreiding. Voeg deze uitbreiding toe je pocket versie van dit spel compleet te maken. .. 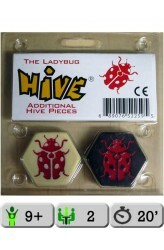 The Ladybug was first introduced to the iPhone version of Hive in 2010. 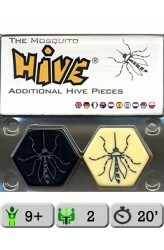 It is included in the "Carbon" and "Pocket" versions of Hive, and has been released as an expansion for the original Bakelite edition of the the Hive base game. The Ladybug moves three spaces; two on top of the Hive, then one down. It must move exactly two on top of the Hive and then move one down on its last move. It may not move around the outside of the Hive and may not end its movement on top of the Hive. Even though it cannot block by landing on top of other pieces like the Beetle, it can move into or out of surrounded spaces. It also has the advantage of being much faster. The expansion consists of two game pieces (one each for the black and for the white player), to be used in addition to the pieces o.. 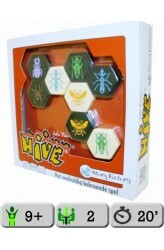 The Mosquito pieces can be added to a standard Hive set before the start of the game giving each player 12 pieces to play with. During the game, they are placed in the same way as the other pieces. Once in play, the Mosquito takes on the movement characteristics of any creature it touches at the time, thus changing its characteristics throughout the game. Exception: If moved as a Beetle on top of the Hive, it continues to move as a Beetle until it climbs down from the Hive. 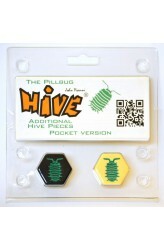 https://www.youtube.com/watch?v=JRiE1OPoJuA ..
Hive: The Pillbug is a new pair of tiles that can be added to Hive. The pillbug moves like the queen bee – one space at a time – but it also has a special ability that it may use instead of moving. This ability allows the pillbug to move an adjacent unstacked piece (whether friendly or enemy) two spaces: up onto the pillbug itself, then down into an empty space adjacent to itself. Some exceptions for this ability: The Pillbug may not move the piece most recently moved by the opponent. The Pillbug may not move any piece in a stack of pieces. The Pillbug may not move a piece if it splits the hive (violating the One Hive Rule). The Pillbug may not move a piece through a too-narrow gap of stacked pieces (violating the Freedom to Move Rule). Any piece which ph..